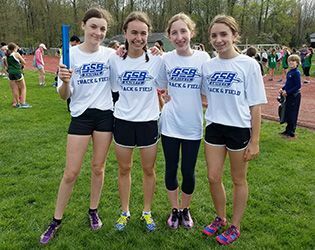 Yesterday, the Middle School girls' track and field team tied for first place among 13 teams at Pingry’s Big Blue Invitational. Adding to an outstanding day, the boys’ team took fourth place. In the girls' 4x100 relay, the team of Ava Escousse '21, Lauren Kroese '22, Leigh Reid '21 and Caroline Solondz '21set a new school record with a time of 55.8, breaking the 2012 record of 55.9 In the girls' 100m hurdle, the team of Reid, Lauren Rossiter '23 and Emily Sumeray '22 took first place. In addition, the duo of Kroese and Sumeray took first in the long jump. Highlights from the boys' side include a second-place finish by the 4x100 relay team of eighth-graders Adam Berrocal, Sohan De Silva, Matt Raymonds and Ben Wetzel. The 4x200 team (Bart Benoit '21, Berrocal, De Silva and Wetzel) took third place as did the discus relay duo of Robbie DeVergillo '22 and Zach Yekta '21. Gill will host the upcoming Silver Spike Invitational on May 3. Competition begins at 3:30 p.m. and features individual championships, with medals awarded to the top three performers in each event. The afternoon will wrap up with an open 4x100. Middle School track and field head coach Shelly Labarre anticipates a strong showing from Gill and invites everyone to come out and cheer on our athletes. The Booster Hut will also be open for concessions.